ACAS’ Youth Program for East and Southeast Asians aged 16-29 strives to increase education, opportunities, support and resiliency skills (being able to bounce back from adversity) for Asian youth in Toronto in dealing with the various social/health challenges and questions of being LGBTQ+ and of other genders or sexualities. QAY explores a variety of topics like: sexual health, HIV/AIDS/STI prevention, healthy relationships, anti-oppression, intersectionality, mental health, and harm-reduction. We also have fun socials every month and recreational events! If you have anything you want to explore or pursue that’s related to the LGBTQ+ East and Southeast Asian identity, come and speak to us! As a program for youth by youth, all our activities are based on a non-judgmental peer education approach. 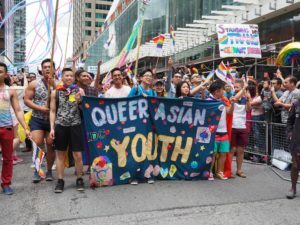 Queer Asian Youth (QAY) is an initiative of the ACAS Youth Program that has been providing social spaces, capacity development, and peer support for LGBTTQQ+, curious and undecided East and Southeast Asian youths and their friends since 2000. Follow Queer Asian Youth on Facebook, Instagram, and Twitter for up to date events. Not out of the closet? Get in touch with the youth coordinator to ask how to join our private Facebook group for QAY. Our Youth coordinator and peer leaders who have undergone training are here to provide support and information regarding healthy sexuality. Over the years QAY and ACAS have developed multilingual brochures and resources on HIV prevention, testing, coming out, and other issues related to healthy sexuality. QAY has also released zines and a published works of poetry and stories. When You’re Ready is an 8-week program where LGBTQ+ Asian youth (18-29) are able to explore topics related to their identity and their “coming out” experience and issues like: anti-oppression, intersectionality, shadeism, chosen family, mindfulness and many more interesting topics. The objective of this program is to equip youth with resiliency skills to tackle the stress that comes along with coming into their own identity, while creating bonds and peer-support networks. If you’re interested in joining a group, contact us at youth@acas.org! 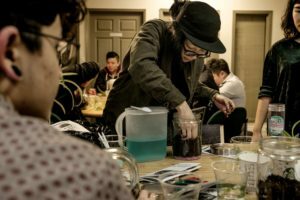 QAY Health Promotion Project encourages LGBTQ+ Asian youth (16-29) to take a more holistic approach to health, as well as bringing awareness to the harmful effects of tobacco. We have a series of Taiko Drumming workshops with Raging Asian Women (RAW), health promotional workshops (like, healthy affordable cooking and at-home workouts), and recreational events (like, board games and nature hikes). Throughout the year we have events for Youth (who are also welcome at ACAS events). Follow Queer Asian Youth on Facebook, Instagram, and Twitter for up to date events. We often do ticket giveaways too! Every pride, the Health Promotion team organizes the QAY Pride Stage where LGBTQ+ Asian youth have a chance to showcase their skills and talents. We’ve had punk bands, stand-up comedians, spoken word artists, kpop dance crews, fierce drag queens, sweet singing duos and power ballad solo artists come and perform on our stage! Recently, we’ve made the Pride Stage a fundraiser for the performing artists to jump start their artistic journey! Make sure to keep a look out for our pride stage, and maybe you can perform on our stage! When possible QAY provides a yearly all-day facilitated forum for East and Southeast Asian Youth to gather and have a space to share their experiences and talk about the issues that matter to them. The 2005 theme for the Queer Asian Youth Forum was: Fact for Friction and for 2011 was Asians in Motion. These forums are well attended a favourite among youth. With many grants and funding aimed at Youth from the government of Canada and other sources, ACAS can help connect youth to opportunities. We can assist in grant writing or helping with the process of applying. We also distribute relevant youth related opportunities through social media so definitely follow us! And if you have a project that interests you come talk to us!